The Javits Center is a 2.1 million square foot behemoth convention center located on the west side of Manhattan. It's host to some of the largest events that occur in New York City, opening its doors to two million visitors every year. And as of this spring, it's home to the largest green roof in North Eastern United States—though you'd never know it from the ground. 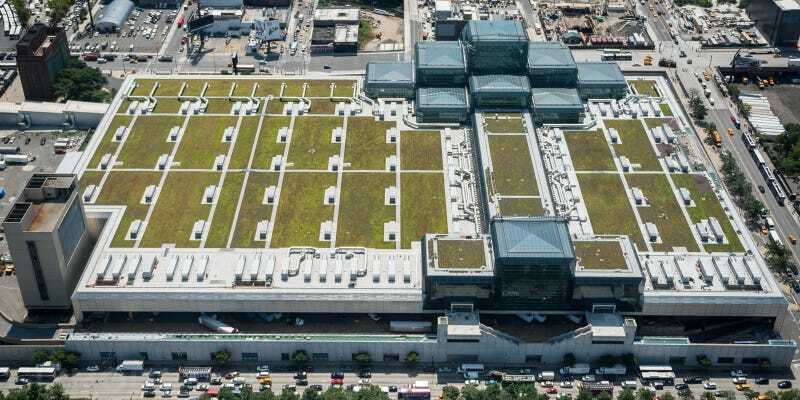 A recent renovation spanned across multiple parts of the Javits Center, however, the most intriguing part is the new green roof. Spanning 6.75 acres across the roof, rectangular patches of sedum now cover much of the available space in an orange-green vegetation, which is projected to collect 6.8 million gallons of water over the year, significantly reducing run off. The green roof, along with the rest of the renovation, helps reduce the energy consumption of the building by 26 percent—all the while providing a miniature wildlife habitat. The only way to walk around the roof is through built in pathways comprised of loose tiles—walking on the fragile sedum is prohibited. The paths have a over a hundred HVAC units dotted throughout. These units are brand new, giving the convention center new, super-efficient air conditioning. Javits also installed more than 6,000 new glass panels in the space, replacing the older, less efficient ones. The new panels are translucent and pixelated. They allow much more light into the halls and are a deterrent to bird crashes, which used to be a big issue for the glassy convention center. All in all, the $460 million renovation is a win-win for Javits, the city, and the local environment. The roof provides an amazing view and reduces costs for the building along with being generally more economically responsible. The facility will continue to host the massive conventions we love and hate for the foreseeable future, but now, those events will be a bit greener.